Today I am sharing with you the card design I made for my first ever class. This was a simple card that showcased the new in colours 2016-2018 and the matching DSP. Some of my customers used the ribbon and others used enamel dots and retired candy dots to embellish their card. The card was such a hit that some of the ladies stayed later to make a second card of their choice. This one was a fathers day theme but the father sentiment was excluded for those that didn't need it. The card was 4x6 inches that's 10x15cm. The DSP layer was 1/4 inch shorter and narrower or 1 cm shorter and narrower. The very vanilla layer was 1/4 inch shorter and narrower or 1 cm shorter and narrower than the DSP layer. They used the retired 2 1/2 inch circle punch and the current 2 inch circle punch and the 1 3/4 inch circle punch. They sponged the edges and we stamped off then stamped the compass in the corner. We popped the world and sentiment up with dimensionals. 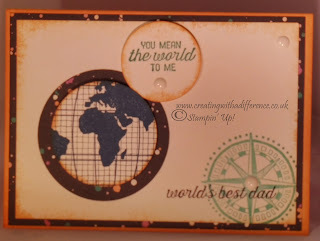 The father sentiment was stamped straight onto the layer. I embellished mine with some enamel dots. This was simple but effective and I think this is the best kind of project for your first event. Please contact me if you have any questions.